Honors Northeast presents film trailer in Nacogdoches. Six Northeast Texas Community College honors freshman recently presented the trailer of their new original film on Barbara Conrad at the annual fall meeting of the Walter Prescott Webb Historical Society in Nacogdoches. The Webb Society is the collegiate auxiliary of the Texas State Historical Association. 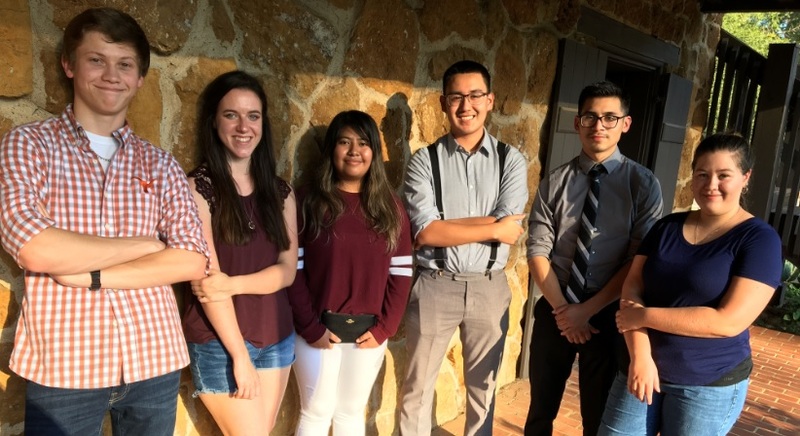 Pictured (from left) Jacob Lambie, Peyton McClendon, Verania Leyva-Garcia, Miguel Paco, Daniel Landaverde, and Mercedes Collins all have taken significant roles in the production of the film, due for a premiere this February. All took turns presenting critical aspects of the film’s development. The group showed the trailer and discussed various issues of what went into creating the film. The trailer for the Barbara Conrad film, created by Paco, is available on the Honors Northeast website at www.ntcc.edu/honorsfilms, along with six other feature-length honors films. Honors Northeast is now accepting applications for the 2019-20 school year. Those with questions should contact Dr. Andrew Yox, Honors Director at 903-434-8229 or ayox@ntcc.edu.